Welcome To Our Kitchen At New Kitchen Life! We’re so happy that you’ve found our site, look around our virtual kitchen and explore our content to help you live your new kitchen life. We want to help you become a better cook, or help you find great recipes, dinner ideas, even easy dinner ideas or cooking tips. You will also find help or inspiration for your entertaining ideas. Whether finding the right way to form a dinner group, cooking club or just throw a fun party, we’ve got you covered. Our virtual kitchen didn’t get to become so beautiful on it’s own. We will even give you a few tips about how to spruce up your kitchen to make you a better cook and even to make you proud to entertain inside your kitchen! We even help you to get more done in your kitchen with better tools and appliances. From ranges and ovens to kitchen appliances, we review the best products to make sure they’ll work in your kitchen as well as they work in ours. What About Our Virtual Kitchen? Our virtual kitchen is an example of our ideal kitchen and one that you may like too. It represents not only a beautifully styled kitchen, but also a productive kitchen where meals can be made and served to grateful family and friends. Where you and your family and friends may gather to enjoy all that a kitchen can bring to your life. The kitchen is where people gather because it’s fun, there’s food and drink and real relationships are shared take place. The kitchen is the center of our virtual kitchen and we want to make sure that it is or can become the center of yours. 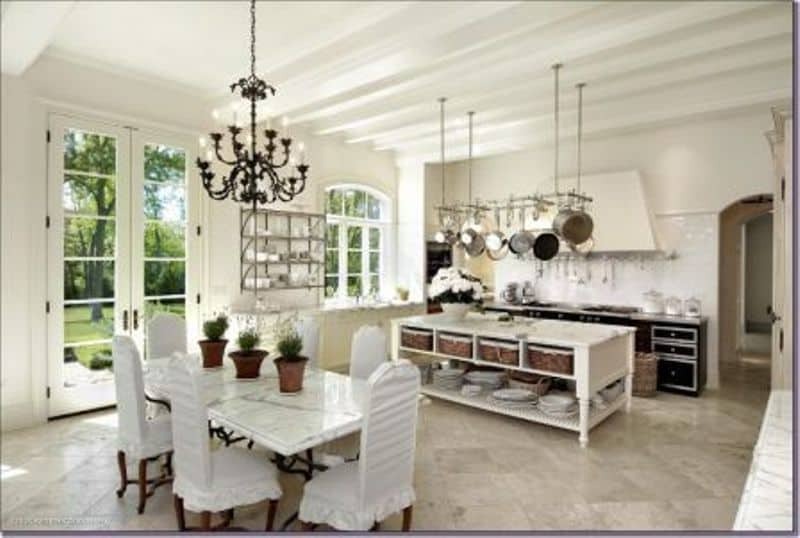 We want to share this ideal kitchen with you through all of the content on our site. So browse our content to help you life a new kitchen life. What Kind Of Recipes Can You Find On New Kitchen Life? One of our favorite recipes is Alton Brown’s steak recipe. We cooked with this recipe so many times because it’s perfect. It uses your own oven and burners in combination at high heat to cook your favorite cut of steak just like a steakhouse does, but a lot less expensive. It also only takes a few minutes, another reason why it’s one of our favorites. Another recipe, or fun dinner idea we like quite lot is Jamie Oliver’s Spaghetti alla Carbonara. There are so many carbonara recipes and variations, but we think this one is the best, with just the right ratio of pasta to protein. We even make a protein swap from Jamie’s recipe based on our preference, but you may prefer to keep it “as-is”. One of our entertaining articles walks through how you might form a dinner group to get more out of your kitchen, or to just show it off after you’ve made that expensive renovation (we have a summary article on kitchen renovation too!). It’s at least a fun guide to inspire you with a lot of options to expand your social circle and show everyone how great of a cook you’ve become! There’s even a fun quiz we have here at New Kitchen Life to help you test your “foodie” knowledge. Test yourself against your friends and family to see how you stack up among the truly chefs. What About Kitchen Appliance Reviews? We also thoroughly review all of Subzero Wolf’s gas and electric ranges. We have individual reviews of several models, from the smallest 30 inch range to the 60 inch double oven. We also review them all in a comprehensive guide with all of each oven’s features, specifications and different configurations in our comprehensive Wolf range guide. You will also find on our site a very comprehensive review of Wolf’s latest and smallest addition to it’s product line. This review covers Wolf Gourmet countertop oven, a fully functional Wolf oven that reaches the same 550 degree Fahrenheit temperature that full sized Wolf ovens reach. You may also see how Wolf Gourmet compares among the best countertop ovens here. The Wolf Gourmet Countertop Oven is part of Wolf’s small appliance line, Wolf Gourmet. The Wolf Gourmet product line includes a wonderful Wolf Gourmet blender (see how it compares with our best rated blenders here), two differently sized toasters, a slow cooker, knives and cookware. We want to you to bookmark our site and make it a regular place to visit and relax in our virtual kitchen so that you may better do so in yours! We also have an outside kitchen on Facebook, You Tube, Pinterest, Google+, Twitter and Instagram. Feel free to roam there too to see latest posts, pins, video and things we like and think you’ll like too. Visit all of these places to see other content of ours or of content that we really like and think you will too. We’d be happy to hear from you with any tips, suggestions and any knowledge you may have for us! There’s a whole lot of foodie and kitchen knowledge in a lot of different subjects, we’re open to all of it as long as it helps you to live a new kitchen life.